Immediately following Donald Trump’s election, private-prison stocks soared. The $5-billion industry had just been severely hit by a policy decision from the Obama administration, and it was facing a groundswell of public opposition. But with Trump voicing support for prison privatization and promising an immigration crackdown, operators have been presented with a boon where they had feared a bust. Private prisons hold just a small fraction of US prisoners—about 8% overall, and 18% of federal inmates, and some argue that their role is overblown in the public debate. 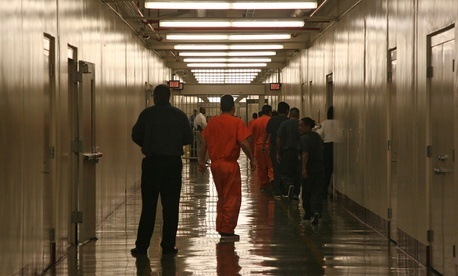 However, private operators are set to cash in on both the expansion of immigration-detention facilities—the companies hold about 65% of all Immigration and Customs Enforcement detainees—and continuing privatization of federal prisons, where many inmates serve time for immigration felonies such as unlawful re-entry. According a Los Angeles Times report, the administration plans to double the number of immigration detainees to 80,000, and it will need much more space to do that. Private prisons are a solution. The bounce came after a bad dip for the industry, when an Obama-era memo declared that the federal government would phase out the use of private prisons. The memo followed a Justice Department report that found they did not save the government money, and were less safe than publicly run facilities. This decision, lauded by criminal justice reform circles, was quickly rescinded by Trump’s attorney general Jeff Sessions. The turnaround has two Democratic US senators, Chris Van Hollen of Maryland and Cory Booker of New Jersey, seeking answers on Trump administration plans for more private prisons, criticized for years by advocates as inhumane. As Vox reports, Booker and Van Hollen specifically ask for “clarification” from Sessions on his decision to rescind the phasing-out of private prisons by the Justice Department. “We are concerned that your decision to shift policy, and no longer reduce the federal government’s use and reliance on private prisons, will hinder recent progress towards reforming our broken criminal justice system,” they wrote to Sessions. During the campaign, the industry quickly recognized Trump as their man. GEO Group, one of the two largest prison operators, was one of the few publicly traded companies to openly donate large sums to the Trump effort. Both GEO Group and CoreCivic, the other industry giant, donated to the presidential inauguration. One donation, the senators point out, came a day after the Obama Justice Department’s decision to eliminate their use of private facilities.